As hosts ourselves we became tired of attending the same black tie dinners and corporate events time and time again. Yes we needed to entertain clients and yes, we wanted to do our bit for charity but we couldn't help thinking that we were missing a trick. So, we decided to bring a completely new event to Aberdeen where the aim of the game is to have more fun than your average black tie dinner while still raising money for local causes. The result is Sportschallenge. We have kissed goodbye to bland after dinner speakers and the bleakness of having to listen to endless auctions. These tried and tested formats work, just not at Sportschallenge. 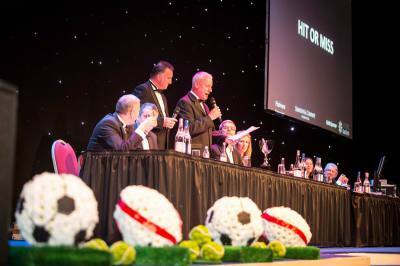 At Sportschallenge, minds race and sweat levels soar as your team competes to lift the trophy after 5 rounds of sports trivia hosted by Sky Sports presenters and well known sporting professionals. 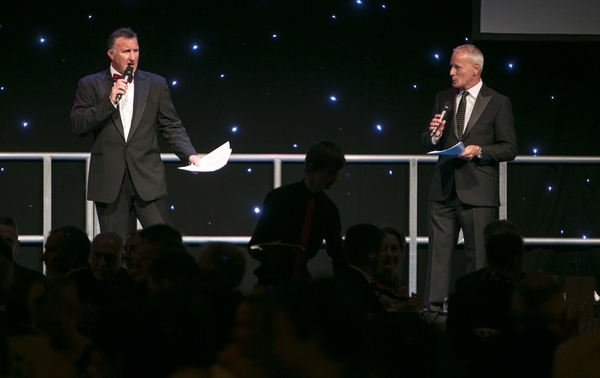 Jim White, Alan McInally, Ally McCoist & Andy Nicol have all previously kept the crowds entertained with their wit and banter. Over the last 6 years Sportschallenge has hit the back of the net raising over £500,000 for charity. Every year, hundreds of challengers, compete in teams of 10 to be crowned champions. Oil & Gas, construction, hospitality companies and professional service businesses all come together to battle it out. Our real winners though are our chosen charities. Each year we continue to support Maggie's Aberdeen and Children's Aid. In addition we also choose 2 or 3 smaller, lower profile causes as beneficiaries. You can read more about our charities here. Sportschallenge works thanks to all different kinds of support. Cue our platinum sponsor, Simmons & Company and gold sponsor CNR International. Thanks to league sponsors Coretrax & Blackwood Partners and hit or miss sponsor DnB, the prizes up for grabs are always a hit. Then there's the hosts, donors and not to forget our lovely volunteers who make sure the the evening goes without a hitch. Why sign up? A combination of entertainment value, business development, team building, doing your bit for charity, showcasing your company and just for the sheer craic of it. Click here to see what supporters have to say on our testimonials page.